Adnexal lesions are a common incidental finding of abdominal imaging examinations of postmenopausal women. The majority of these are less than 3 cm, benign, and require no additional evaluation or follow-up, according to American College of Radiology (ACR) recommendations. However, postmenopausal survivors of non-ovarian cancer may be at higher risk of developing malignant adnexal lesions. So when lesions are discovered, what type and frequency of imaging follow-up is needed? Current guidelines from the ACR and the Society of Radiologists in Ultrasound (SRU) partially address this topic and suggest different cut-offs for further evaluation and follow-up. But in a study published online June 20 in Abdominal Radiology, researchers at the University of Washington Medical Center in Seattle believe that many radiologists recommend further evaluation with ultrasound for all adnexal lesions larger than 1 cm, preferring to be extra careful given the history of malignancy. They conducted a study to determine if computed tomography (CT) morphology of adnexal lesions could be used to distinguish benign from malignant lesions and eliminate the need for annual ultrasound exams for women with a history of non-ovarian cancer. The patient cohort included 199 women, nearly half of whom had non-ovarian metastatic disease visualized on CT when their adnexal lesions were identified. Three body radiologists reviewed in consensus the initial CT exam and follow-up imaging studies of all patients. They recorded all relevant imaging features of the lesions. Lesion size was determined by the longest single dimension measured on axial, coronal, and/or sagittal planes. The radiologists classified the lesions as simple cystic, complex cystic, solid-cystic, or solid based on ACR criteria. A total of 223 lesions were identified, ranging from 1.2 to 22 cm with a median size of 2.8 cm. Fifty-five percent were simple cysts, and all were benign. Twenty-nine patients (15% of the total) had at least one malignant lesion, and eight had bilateral malignancies. The 37 malignant lesions were larger than the 186 benign ones (median 5 cm. vs 3 cm. respectively), and the presence of an enhancing or solid component was an independent predictor of malignancy. Neither calcifications nor hemorrhage was significantly associated with malignancy. A higher percentage of non-simple cysts larger than 3 cm were malignant compared to those that were smaller (49% and 14%, respectively). Solid-cystic and solid lesions were more likely to be malignant than complex cystic ones. The researchers, led by Akshay D. Baheti, MD, a radiologist at Tata Memorial Center at Homi Bhabha National Institute in Mumbai, India, wrote that their findings support ACR guidelines that benign-appearing cysts 3 cm or less in early and late postmenopausal patients do not require further evaluation with ultrasound or follow-up, and may also be applicable for survivors of non-ovarian cancers. They also suggest follow-up for certain hyperattenuating complex cysts may not need to be as stringent because these types of cysts also have a low likelihood of malignancy. Conversely, the authors recommended that patients with solid-cystic and solid adnexal lesions be evaluated with additional imaging or surgery due to their higher likelihood of malignancy. The authors reported a significantly higher risk of ovarian involvement in patients with peritoneal metastasis, and that any lesions that do not appear benign should also be investigated immediately. Patients with colorectal cancer also had a significantly increased risk of adnexal metastases. Baheti AD, Lewis CE, Hippe DS, et al. Adnexal lesions detected on CT in postmenopausal females with non-ovarian malignancy: do simple cysts need follow-up? Abdom Radiol. Published online June 20, 2018. doi.org/10.1007/s00261-018-1676-z. 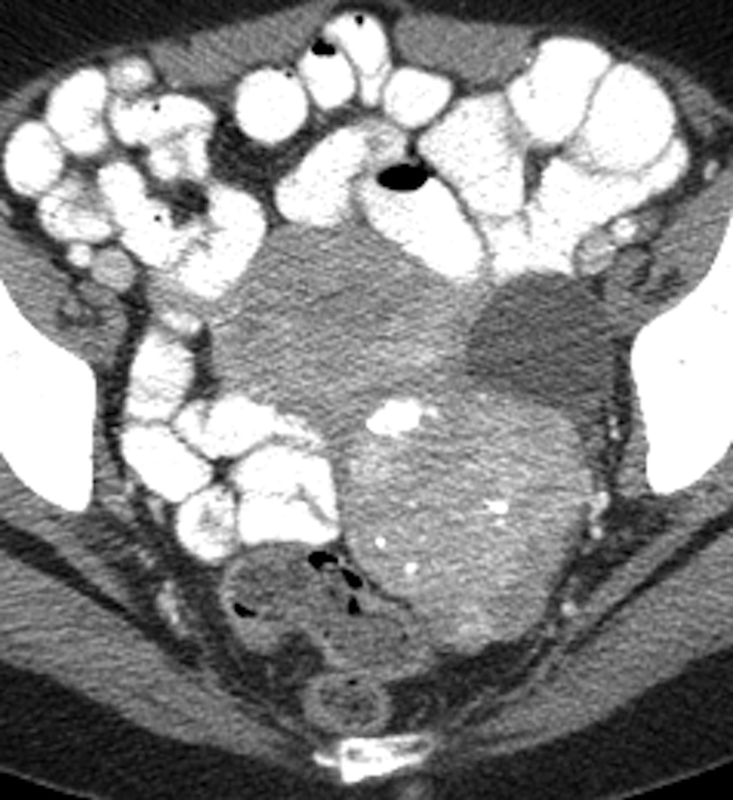 CT aids adnexal lesion management of postmenopausal cancer survivors. Appl Radiol.